Alberta Adams was dubbed the Queen of the Blues in Detroit back in the 1940s. She's certainly the Queen Mum of Motown these days. There hasn't been such a fuss over a blues gal in the Motor City since Sippie Wallace ruled the roost. Following her acclaimed debut CD of last year, the 80-something Ms. Adams has a sophomore effort that will much to spread the word beyond the city limits. Even though she toured the world with the likes of Duke Ellington and Louis Prima half a century ago, Alberta has been pretty much of a stay-at-home singer for most of her career. Being the matriarch of an on-fire blues scene is a pretty good gig, but as she's been proving for the past year or so, the roadworthy Alberta Adams mystique has been knockin' listeners out all around the world. If you haven't seen her yet, let this serve as an intro. Alberta originally cut the leadoff title cut for Savoy. The year 2000 version is spiced up by Johnnie Bassett and the rubberband-tight Blues Insurgents who add snappy punch. Alberta sings "you a no good man and this time you've gone too far." She then backs that number up with "No Good Man" (did someone say theme?) on which she sings "you a no good man and I'm here to tell you so." Alberta's about presence. She's fun to listen to and she has a lot of fun givin' it up. She's also a first-rate song smith, having written three of the 11 assembled tunes. Bill Heid, the pianist who, along with drummer and manager R.J. Spangler, persuaded Alberta to get back into the game after a years-long layoff, has a few tunes to his credit here, as well. His tasty piano playing is a treat throughout, particularly on the jazzy "I Want A Man." Alberta's "I Cried My Last Tear" ("4 o'clock this morning I cried my last tear for you/you gave me no reason/no reason to treat me the way you do.") 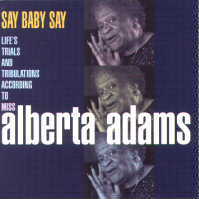 may be the most representative of her blues groove here, and the groove she rides on "We Ain't Makin' Money" may be the most representative of a "typical" Alberta Adams song. Upbeat, bouncy, sassy and talkin' stuff. Alberta Adams is one of the last of the great blues women still singing and, more importantly, still sounding great in the process. She's also wise enough to surround herself with some spectacular musicians. The results is sweet, sweet ear candy. This review is copyright © 2000 by Mark E. Gallo, and Blues On Stage, all rights reserved. Copy, duplication or download prohibited without written permission. For permission to use this review please send an E-mail to Ray Stiles.